I’ve been a fan of all things Danny George Wilson since the halcyon days of Grand Drive, 100 or more years ago. The majesty of those early recordings; alongside brother Julian have been difficult to replicate. Although, it’s fair to say a couple of solo concerts hinted at what was possible; but the Champions output was hit and miss until, their last album Stay True; which I personally hailed as a Masterpiece and it became my album of 2013. Which brings me to What Kind of Love? Which I approached rather hesitantly as my expectations were very high; and I was afraid of being disappointed; especially as my review copy arrived after the release and Social Media has subsequently gone into meltdown with praise. Opening with Clear Water it’s plain to hear Mr Wilson and friends have been listening to a lot of old Soul records; probably of a Northern Soul and Atlantic Records vintage. 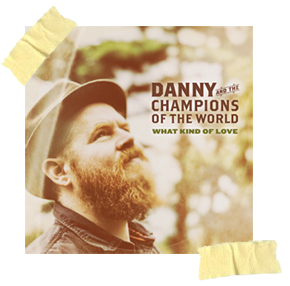 The song swings along nicely and Danny’s voice croons midway between Graham Parker and Al Green as the Champions and freshly assembled horn section kick up a mighty groove. Tracks #2 & #3 Precious Cargo And This is Not a Love Song slide seamlessly into Country-Soul territory with some sublime lap-steel as Danny pleads and wails as some pretty girls (I presume that they are pretty) provide honey-dripping harmonies on the choruses. So far; so good; and everything rolls along sweetly; with no spectacular and no obvious lows on What Kind of Love, with the title track slightly standing out like a poppy in a field of wheat. The lyrics are very personal and Wilson’s delivery is straight out of the Otis Redding playbook and it works. My favourite song; although it’s a very close race, is It’ll Be Alright in the end; for no other reason than the poetically clever lyrics touched me – right place/right time. Again the whole band groove like good ‘uns in a way I’ve not heard since the days of Graham Parker and the Rumour and even Dexy’s Midnight Runners albums (not the singles). Favourite song #2 is Music on the Wind with it’s funky guitar breaks, Hammond solos and the best use of “Sha La La La” in a chorus since 1973. After playing the album all day – probably a dozen or more rotations; I really, really like What Kind of Love; as it’s quintessentially English take on Atlantic/Stax era Soul with a slight Country flavour – Pub Rock at it’s finest. Is it better than Stay True? It’s probably not fair to compare; as that album took completely by surprise when it was released; and this album is a soft-shoe shuffle in a completely different direction and I applaud them for that brave decision.